As we begin Passion Week this weekend, what was the historical climate of Easter Week almost 2,000 years ago surrounding the last week of the life of Jesus of Nazareth? This was a man born to die, not just in the normal sense, but in some special sense. Jesus entered Jerusalem amidst a torrent of turbulence: religious, political, military, social, and economic. Palm Sunday: what was the climate of the city when Jesus entered? The Trial: what took place during the trials, what laws were involved? The Crucifixion: what was involved on Good Friday? The Resurrection: what do we know about it? Our story begins during the last week of March, A.D. 33 at which time the relationship between the Jews and Rome was already at least 100 years old. In 63 B.C. a dispute arose between two factions of the high priestly family. One of these factions appealed to Rome for assistance. The result of this was that General Pompey arrived in Palestine during his reorganization of the East and made Judea a Roman client kingdom. Herod the Great was appointed king (remember him from the Christmas story?). Upon his death, in 4 B.C. the kingdom was divided into four tetrarchies among his sons. His son Herod Antipas (we’ll meet him again) was given Galilee and Perea. Archelaus received Judah, Idumea, and Samaria which he ruled so poorly that he was banished and replaced by a succession of Roman governors or prefects. Judea was neither one of the more important, nor more illustrious provinces and for that reason was not ruled over by a member of the nobler “senatorial” class of Romans. Instead, a member of the equestrian class (equus=horse, Latin for “knight” or official), the middle class which made up a significant part of the Roman administrative bureaucracy and military. The sixth of these governors was Pontius Pilate. For centuries the Jewish people had awaited the coming of a Messiah, “the anointed one” of God who would rule on the throne of King David and deliver them from their oppressors. This expectation ran throughout the Hebrew Bible, with several themes attached: God’s vice-regent on earth, a deliverer from political oppression, a suffering servant who would deliver the people from their sins, an eternal ruler. During the period between the Old and New Testaments, circa 400 B.C to A.D. 65, a large amount of non-Biblical literature surfaced, called apocryphal and apocalyptic literature, repeating and embellishing the concept of the Messiah. The Greek word for the Hebrew Messiah is christos, or “anointed one,” from which we get the word, Christ. This means that Christ was not Jesus’ last name, but rather a title, Jesus the Christ. Before the Romans, the Jewish people had suffered under a number of occupying oppressors, most recently the Greeks, and before that the Assyrians, the Babylonians, and the Medeo-Persians. After almost a hundred years under the Romans, the expectation for the Messiah had reached almost a fever pitch. This was the condition when Jesus entered Jerusalem on Palm Sunday. Thanks for the nice clear explanation. That older photo of the Old City is an unusual and wonderful perspective. 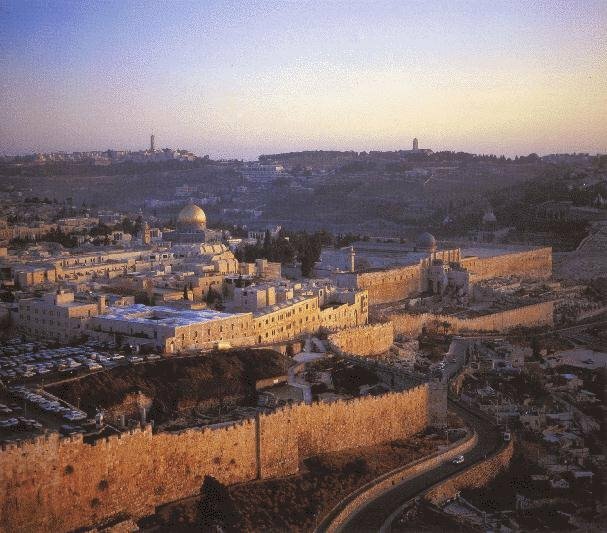 This was my first view of Jerusalem, as I drove up the road in the foreground to approach the Western Wall. that for the artcle more grrace,sir what is the meaning of easter? Thanks for the question. I define that in my first article in the series History of Easter. The German word “Oster” reveals the association of many Easter customs with those of the Teutonic tribes of central Europe. When Christianity reached these people it incorporated many of their “heathen” (of the heath) rites into the great Christian feast day. Easter month, corresponding to our April, was dedicated to Eostre, or Ostara, goddess of the spring. Good reading. Thanks for posting the historical aspect of the time. After reading this I want to do more research on Jewish culture and Roman culture too.